In a career spanning over 30 years, Carla Beaurline (Carla Burleen) has enjoyed a life spent both in front and behind the camera. A lifelong native of Minnesota, she is the current founder and owner of “Around Town” TV & Around Town Media, LLC. Around Town TV started its 16th year on air and is Minneapolis/St. Paul’s longest airing Community Showcase. In addition, Around Town TV is now streamed live worldwide on multiple platforms Tuesday evenings at 7 PM Central Time. She is a Board Member for the Children’s Performing Arts and is on the Sapphire Circle Committee for Make-A-Wish -Minnesota as well as a Board Member for the Alliance for Women in Media Minnesota Chapter. She is a Board of Governor for the National Academy of Television Arts & Sciences for the Upper Midwest Regional Emmy Chapter and serves on their foundation as well. She was the Emcee/Host in 2016 & 2017 and was a 2015 Celebrity Dancer in Dancing with the Twin Cities Celebrities. Carla was a 2014 Twin Cities Finest Honoree awarded through Cystic Fibrosis to successful business professionals who philanthropically give back to the community. She is a 6 time (2017, 2016, 2014, 2013, 2010, 2009) Midwest Business Ethics Award Nominee. 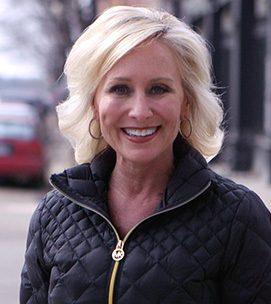 In addition to Carla’s on air resume’ which includes a 13 year stint with Shop NBC, Guest Host for QVC, a host for Talk of The Twin Cities, and providing her talents as an on-air spokesperson for many Twin Cities based businesses—Carla also has over 23 years of experience in media sales. Minnesota’s Lifestyle and Business Expert for Segments on Twin Cities Live; Carla has been a dynamo in the industry, and is well respected among her peers--winning two Twin Cities Media Network Diamond Awards for Television Personality of the Year in both 2007 and 2008 as well as the TV Sales Person of the Year in 2008! She also won a National award in 2008 for 25 Women who Rule in Sales and Marketing and was nominated to the Pavek Museum Broadcaster’s Hall of Fame three times. In 2009 & 2012 Around Town TV was nominated for an Upper Midwest Emmy Award. Carla graduated from Augsburg College in 1991 with a Bachelor of Arts Degrees in Communication and Sociology with an emphasis in Broadcast Journalism. She began her career with CTV North Suburbs where she still volunteers her time to anchor and in 2013 was inducted into their Hall of Fame. Carla is a regular Guest Speaker in the Entrepreneurship Class at Augsburg College. In addition to her many professional responsibilities Carla finds time to volunteer with a number of local and national charities and is a Mentor to youth and adults in Broadcast Journalism. In 1993 Carla founded Leaders and Achievers of America Youth Scholarship, Mentorship, Outreach, Achievement, and Recognition Program which has provided tuition scholarships throughout the country. Since 2005 the Beaurline Family also has provided educational scholarships to youth through the Beaurline Family Scholarship & Educational Foundation. Carla makes her home in Maple Grove and enjoys spending time boating, traveling, watching Gopher & Wild Hockey, watching football; as well as spending time with her family, friends, and her Maltipoo Mimi.